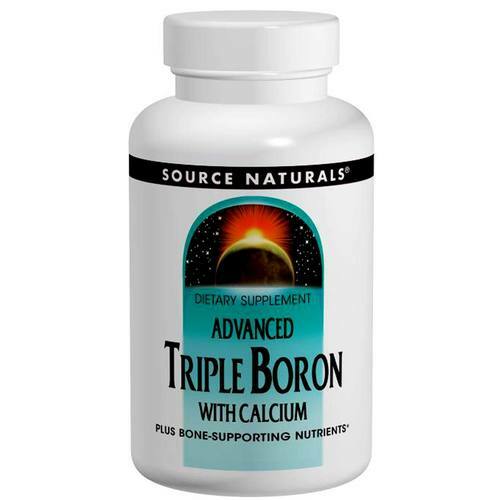 Source Naturals Advanced Triple Boron with Calcium provides doses of Vitamin D, K and B-12 plus more. Advertências: Contains Wheat. If you are pregnant, may become pregnant, or breastfeeding, have hypercalcemia, a hormone sensitive condition, or if you are taking Warfarin (Coumadin(R)), antibiotics, or any other prescription drug, consult your physician before using this product. Do not use if either tamper-evident seal is broken or missing. Keep out of the reach of children. Store in a cool, dry place. Notas: Yeast Free. Dairy Free. Egg Free. Soy Free. Sugar Free. Salt Free. Preservatives Free. Artificial Color Free. Artificial Flavor Free. Artificial Fragrance Free. Recomendações de uso: 2 capsules twice daily with food.